Talofa Samoa! When doctors take a small piece of your skin and examine it under the microscope, what do they see? Cells. Any part of your body examined like that will show cells. It has been calculated that the human body is made up –depending on your size- of between 20 and 80 trillion cells. That’s a lot of cells! But what is even more fascinating is that one third of these cells are ‘immune cells’ that protect you from anything that the body considers foreign, whether it is the flu virus, a bacteria or poisons injected when a mosquito or a centipede bites you. Immune cells are your army of soldiers that protects you from invaders. They are also the ‘clean-up crew’ that fights infection, heals wounds and even repairs clogged arteries. It is a marvel of nature that one third of our body is made up of cells, whose sole function it is to keep us alive and well. That is of course, on condition that we take care of our immune cells. An army of soldiers will not be able to put up a strong fight against foreign invaders if it is not being fed properly. So too will your immune cells require proper food to remain strong and alert to face any attempt to harm your body. And what is the food that the immune cells need to remain all the time ‘on high alert’ and ready to fight anything that could harm you? The answer is simple: plant food! The vitamins, minerals and thousands of plant chemicals that are abundant in plant food are the very nutrients that keep immune cells in top shape. Building up the strength of your immune system (which comprises all the many different types of immune cells) is a strategy for enjoying a long and healthy life. This is even more urgent now when Samoa is in the grips of a near epidemic of obesity and non-communicable diseases like diabetes, high blood pressure, heart disease and cancer. Each of these medical conditions requires a strong immune system to prevent them from damaging your health. Unfortunately, the very cause of why you might have developed these conditions is also the cause why your immune system is weakened: the fatty Western Animal based diet you are or have been consuming. But fortunately, a very simple remedy is at hand: adopt the whole foods, plant based (WFPB) nutrition promoted by METI. It reverses or slows down these dreadful diseases and at the same time it strengthens your immune system to the point where boils and infected wounds hardly ever bother you anymore. I remember talking with teachers, who complain how often they have to send children home because they have boils or infected sores all over their body. And then talk to someone, who has followed the WFPB diet for a while: she will tell you that she can’t remember when it was the last time she noticed a boil under her arm. As Dr. Albert Schweitzer, Nobel Prize Laureate of Peace once remarked: “Each patient carries his own doctor inside himself (his immune system)”. Remember Faumuina’s testimony that by strictly following the WFPB diet he was able –not only to reverse his diabetic condition – but also to heal the chronic infection in his foot that had been there for months and so avoided to have an amputation. If any of you reading this page want to know more about the WFPB diet, and how it reverses diabetes, high blood pressure and heart disease or boosts your immune system, come visit METI’s Clinic at Motootua and register to attend the weekly Health Seminar –in Samoan or English- and the Cooking demonstration. You can reach us at 7636358 or 7239297 during working hours, 8 am to 4 pm, Monday to Friday. 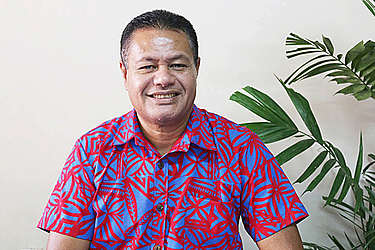 I was a very strong and healthy young man in my youth, a very strong rugby player for SCOPA, Vaimoso and the Fasito’otai Rugby Club for many years. In 2013 I was diagnosed as a Diabetic patient when I had some problems with a wound on my left foot that was hard to heal; the lower part of my foot was swollen with a continuous running discharge. From that moment I started taking Diabetic medication, 2 metformin 500mg daily, until the doctor increased my dose to 2 metformin 500mgs twice a day and one 5mg Daonil daily. I continued to manage with my diet and medication, but after four years there was no change, things were getting worse. I lost a lot of weight, I felt so tired and dizzy most of the time. I started to have excessive joint pains. My vision was becoming blurred. My left foot was still swollen with a discharge. My medication was increased to 1000mg of metformin twice a day and 10mg Daonil twice a day. In spite of that my blood sugar stayed high. In September 2017, I woke up one morning and noticed I was losing my vision in both eyes and then I urgently consulted the Eye Clinic for help. Dr Ah Ching found out that the capillaries in my right eye were bleeding and my left eye was also affected. She told me she couldn’t offer any treatment until my blood sugar level was reduced. She referred me to the METI Clinic for Dietary advice to control my blood sugar and to help with the healing process. At the METI Clinic the next morning, I had my blood sugar tested and it was a sad story for me, when the result came up with 19.2. I was so shocked and anxious. From that day onwards I started with the Whole Foods, Plant Based diet as recommended. The challenge of following a Vegetables and Fruits diet without meat wasn’t easy for me but because I wanted to live, I made a sacrifice and fully committed myself to it. After two weeks on this diet, I felt good and was told to stop all medication. I carried on with the diet and after a month I started to take some training and exercise to support my diet challenge. After the first week of my challenge, my blood sugar dropped from 19 to 9.7, the third visit was 13, my fourth visit was 7 and my last visit was 4. I am now having a new feeling all over my body, no more fatigue or exhaustion. No more swelling and discharge from my left foot. I now wake up early every morning before 5am.The mobility of my body movements has started to come back, no more joint pains as previously. I have a family history of Diabetes: both my mother and all her brothers died of Diabetes. That’s why I have the courage to take a stand to fight this killer in my life. In the mean time I am continuing with my diet, I’m happy to do it for my health. My daughter also joins me with the challenge to support me, and after a few weeks she also has lost weight. Within 2 months I lost 12 kilograms. I am happy to continue this program for a healthy life style and better life. I recommend anyone with Diabetes to get on this METI diet programme.